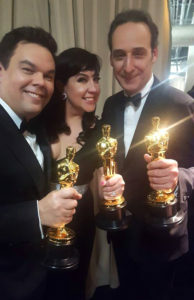 Another awards season is finally in the books, with Sunday night’s Oscar telecast that saw Alexandre Desplat win for his Shape of Water score, and songwriters Robert Lopez and Kristen Anderson-Lopez for their song “Remember Me” from Coco. Variety kept me busy all weekend, writing the winner stories (score story here, including Desplat’s beating the statistical odds for a second time; song story here) and adding a Monday-morning story about Lopez becoming the first-ever double EGOT winner. A complete summary of Saturday and Sunday events — including the annual SCL Oscar reception, always a highlight of the weekend, is here. This entry was posted in Composers, Film Music and tagged Alexandre Desplat, double EGOT, Kristen Anderson-Lopez, Oscar 2018, Oscar music, Robert Lopez, Society of Composers & Lyricists, Variety on March 5, 2018 by Jon Burlingame.